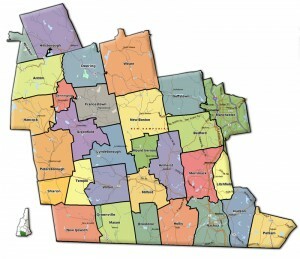 Hillsborough County is the most populous county in the state of New Hampshire, including its capital city Manchester and the expanding Nashua. Other growing towns include Amherst, Bedford, Brookline, Hollis, Merrimack and Milford among others. In NH, past studies estimate that a relatively high number of randomly selected private bedrock wells contain concentrations of arsenic exceeding the MCL.1,2,3 The southeastern region of the state has the greatest potential for arsenic concentrations greater than or equal to 5 ppb and 10 ppb. There may be 41,000 people in just the counties of Hillsborough county, Merrimack, Strafford, and Rockingham that are drinking water with arsenic levels above the EPA standard. 4,5. For more information on Arsenic in Drinking water, see the link at Arsenic in Drinking Water. The need for a water filtration system to remove arsenic from drinking water may be critical depending on the test results of your particular well water. In light of a study released by the U.S. Geological Survey, the New Hampshire Department of Environmental Services (NHDES) urges everyone with a private well to test their water. The USGS study found that 80,000 residents in Hillsborough County, Rockingham, and Strafford counties alone may have unhealthy levels of one or more toxic metals in their drinking water. Radon in water is another concern in many areas within Rockingham County. Also prevalent is Arsenic in well water. Some of the towns these contaminants have been found in include Atkinson, Kingston, Hampton, Auburn, Raymond and Windham among others. Again, a water filtration system designed specifically for arsenic removal or radon removal from water may be critical.